TEMPLE, Texas — Around 2:10 a.m., most severe weather warnings and watches were dismissed for several Central Texas counties. According to Oncor's outage map, at around midnight Thursday about 4,000 people were without power in Bell County. Oncor's website said power would be back on at 3:30 a.m. Thursday. More than 3,000 customers were without power in McLennan County. In Coryell County, Oncor said there were more than 1,000 outages, and power would return around 4 a.m. Thursday. The National Weather Service said the storms that started a severe thunderstorm warning for Bell and Coryell counties at 11:15 p.m. Wednesday fell below the severe limit, so the warning has expired. The tornado warning for Williamson and Burnet counties expired at 11:30 p.m., however, the NWS said rain and hail is still falling in the area. The National Weather Service issued a severe thunderstorm warning for northwestern Mills County and southwestern Comanche County around 7:30 p.m.
A severe thunderstorm watch was issued at about 7 p.m. for Hill, Lampasas, Coryell, Bosque and Hamilton counties, according to the National Weather Service. The NWS said the watch is in effect until 2 a.m., and a tornado or two is possible. 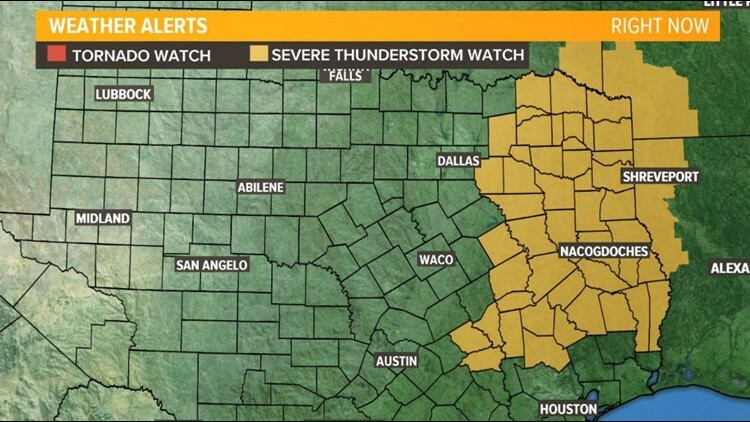 The severe thunderstorm watch was extended at 10:14 p.m. to include Bell, Falls and McLennan counties until 2 a.m. Thursday. An area of low pressure will move through Texas on Wednesday bringing with it another round showers and thunderstorms – some will be strong to severe. The Storm Prediction Center issued an "Enhanced Risk" for severe weather—3 out of 5 on the severe weather scale— for most of Central Texas. The main threat during storms will be large quarter to golf ball-size hail, winds up to 60 miles per hour, the possibility of tornadoes, and flash flooding in low-lying areas. Scattered showers and isolated storms will be possible through the evening. Widespread showers and storms will fire up late Wednesday night through the early Thursday morning. Storms will likely start with strong gusty winds. The storms will merge and become more numerous as they approach the I-35 corridor between 10 p.m. and 2 a.m.
Isolated tornadoes could spin up as the storms become strong to severe as they move east and then leave the area by about 4 a.m.
Rainfall amounts of up to an inch and a half will be possible. Storms will be cleared from the area by sunrise Thursday. Sunshine and clear skies will peek through with temperatures in the low 70s. Stay weather aware with the KCEN Weather Warriors. Be sure to prepare your safe place in your home or at your job in case of a weather emergency. If it's safe and ONLY if it's safe, post pictures on the KCEN News Facebook page and like the page for updates. Tag us in your tweets using @KCENNews using #KCEN #CenTXWX and #WeatherWarriors6.